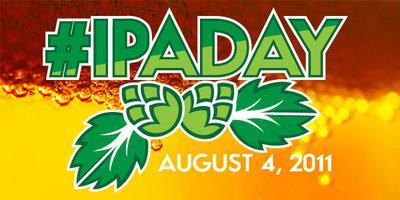 The arrival of the inaugural International #IPA Day is being greeted with a yawn in Oregon. That's probably because every day is IPA Day in the Northwest. The brewers here have taken the IPA style and run with it over the past 15 or so years. As a result, quite a few variations of IPA have appeared and most are pretty good. IPA is arguably the most popular craft beer style in the Northwest. It's hard to find a brewpub or pub that doesn't have several IPAs on tap. They might not have a porter or a stout, but they will have one or more IPAs. On a trip to Laurelwood the other day, they were serving two new IPAs, Aftershock and Best Bet, as well as the standard Workhorse and another high alcohol imperial IPA. So why would there be any question about the future of the style? I suspect it has something to do with an industry that's constantly trying to reinvent itself. Brewers once regarded the production of heavily hopped ales as the new frontier. They met the challenge by adding more and more hops to their IPAs. They tweaked dry hopping formulas and turned to using fresh hops. The result was a sort of hops arms race, in which brewers routinely upped the hops ante. Once heavily hopped beers became mainstream, brewers started looking for the next frontier. They began experimenting with unusual ingredients and building out their portfolios with different styles. We're now seeing sour beers, Belgians, tweaked lagers, mint beers...the list is endless. The average beer consumer has only a faint idea this is happening. He/she still orders an IPA and enjoys the burst of hops. But change is afoot. This is likely part of the evolution of an industry. I suspect we would not have seen the exponential growth of the craft beer industry if early brewers had presented patrons with the variety of styles we are now seeing. Too much variety early on would have stalled growth. What they needed was a narrowly defined style to serve as a platform. The IPA style provided that stability for many years. There's no chance of the IPA style going away anytime soon. Brewers will continue to brew it and people will continue to buy it. But new styles are coming in behind it. When you look at those evolving styles and at the healthy state of the craft beer industry, lift a pint of IPA in recognition. I'm sorry, but IPA after IPA after IPA is absolutely uninventive and boring. Typical American Marketing Hyperbole. If some hoppiness is good, then even more must be grand. Except for the escalation in hop content, I don't agree that the IPA is a monolithic style. There has been plenty of experimentation over the years with different grains, hop varieties, yeasts, etc. One IPA does not necessarily taste like another. Even the imperial IPAs that have become popular exhibit significant differences in taste and character. Nonetheless, the craft industry today is actively expanding the variety of beers it brews and markets. We're seeing Belgian-style beers, sour beers, fruit beers and some really tasty light beers, to name just a few. The industry clearly wants to move beyond, if not away, from the IPA style. IPA isn't going away anytime soon and it remains the most popular style in the Northwest and elsewhere. But change is in the wind.